The former "Governator" says that despite having a stack of scripts to look through, he's already started work on a new film. Now that he's not the governor of California anymore, Arnold Schwarzenegger is mulling over his triumphant return to Hollywood. Among the numerous films that he's contemplating - more than a dozen, according to the man himself - is a comic book project that he says is only weeks away from a formal announcement. Sources suggested that Schwarzenegger had three scripts he was looking at, and at the Arnold Sports Festival in Columbus, Ohio this weekend, fans asked Schwarzenegger about whether those rumors were true. Schwarzenegger said that he actually had fifteen scripts he was looking at, and that they were a mix of original ideas, franchises like Terminator, and remakes of movies like The Running Man and Predator. He also said that he was "packaging" a comic book character - which means that the wheels on the project have already started to move - and that he would reveal the project sometime near the beginning of April. Schwarzenegger has appeared in two comic-book movies in the past: Red Sonja in 1985, and Batman & Robin in 1997. 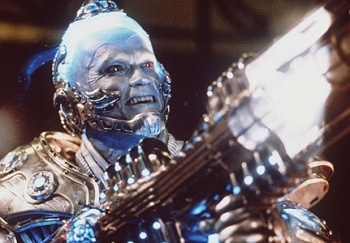 Of the two, the campy Batman & Robin, in which Schwarzenegger plays Mister Freeze, is probably better known, although not necessarily for anything positive. Red Sonja was sandwiched in between more famous Arnie movies like Terminator, Commando and Predator. It tanked at the box office, and Schwarzenegger has called it the worst movie he's ever made. He even joked that he used to use it - or the threat of being forced to watch it, at least - to keep his kids in line. It's not clear what comic book Arnie is now working on, nor what his part will be. As he's now in his sixties, it seems unlikely that he's going to be donning spandex and being a superhero, but there are plenty of comic books that have almost nothing to do with spandex and capes. The recent movie, Red, about retired intelligence operatives, which starred Bruce Willis, Helen Mirren and Morgan Freeman, was based on a comic book by Warren Ellis, for example. Schwarzenegger might not even be acting at all, and instead could serve as the project's producer or even director. With so many comic book projects already announced, however, it might take a household name like Schwarzenegger just to get the project noticed.